Do you love a good romance? What do you like about it? Are you drawn to the stories where both parties fall in love at the same time? Or when one must pursue the other? hard time keeping my hero and heroine apart. Yes, she was angry with him for forgetting about her after high school when he became a huge A-list actor. Yes, she resisted him at every turn once they reunited at the aquarium where she worked. But, I’d be writing a scene, and before long they’d be in each other’s arms. I’d have to throw a conflict in there to get them mad at each other again. However, it didn’t last long. Then I’d have to do it again. This writing business is tough, I tell ya. I had the opposite problem when I wrote Crossroads Bay, the second book of three in the Oregon Weddings series. Paul, a caterer, falls for Meranda, a charter boat captain, but she doesn’t feel the same. She has an agenda looking for her family’s treasure and no one was going to stand in the way of it. I struggled to get these two together. And it wasn’t until Meranda had just hit rock-bottom, and was seeking comfort food in Paul’s restaurant, that she finally saw him as the hero I had created him to be. She looked at me (yes, my characters talk to me…don’t judge,) and said, “Kathy, why didn’t you tell me he was so gorgeous!” After a palm-slap to my forehead, I went back through the story and was then able to write in glimmers of attraction on her end. After writing that first romance, I thought it would be smart to study how the greats do it. I became frustrated as Scarlett rebuffed Rhett’s advances over and over in Gone With the Wind. I cried as Tony and Maria in West Side Story were torn apart by their families. I puzzled how Joe Bradley and Princess Anne in Roman Holiday would ever get together when he was a lowly reporter, and she was royalty. And much, much more research! What makes a good romance? Is it when the two are mutually drawn to each other but kept apart by circumstance as in The Lake House, a love story where the two characters are living in different pockets of time? Is it the tension of bringing two unlikely people together and watching one struggle as the other remains clueless as in Gigi? Or is it when two strong characters fight the attraction until it becomes obvious that they must be together? 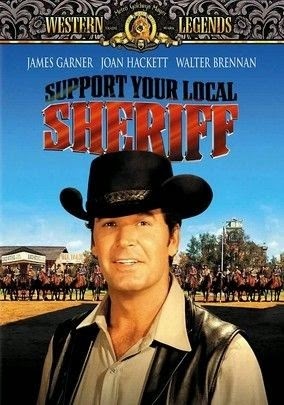 I’d like to talk about Prudy Perkins and Jason McCullough, played by Joan Hackett and James Garner in the Western comedy, Support Your Local Sheriff. Prudy is the mayor’s daughter who has just come into a shocking amount of money via the gold she discovers at the cemetery as they’re burying someone. Jason is the drifter who makes no secret that basically he’s on his way to Australia. Prudy is, of course, attracted to Jason from the beginning. I mean, look at him! It’s James Garner! But she’s also the plucky heroine. Everything has to be her idea, on her timeline. He then moves away quickly before she rectifies that. Their next encounter is after Jason is made sheriff of the town and is on his way to the mayor’s house where he has been promised room and board. Prudy is in the kitchen in her long-handled red underwear, still a muddy mess and washing her hair. She sees Jason and her father come toward the house and panics. Instead of running to her room, which would be way less funny, she scoots out the back and ends up in the tree in her front yard. Jason comes out, spots her, and says, “You’re the strangest girl I ever met.” She says, “Go away,” and pulls her hair over her face. Prudy is finally cleaned up, her hair atop her head and wearing a pretty ruffled blouse and a skirt with a bustle. She’s making biscuits and touches her face, unknowingly leaving a powdery mess. As she backs into the stove, her skirt catches fire. She doesn’t notice it until she carries the meal out to the dining room, and Jason douses her with a whole pitcher of water. Tears trickle over her floured cheeks as she whines, “I’m sick and tired of these things happening to me.” She shakes her fist in Jason’s face. “And somebody better do something about it. Soon!” Then she storms away. Interrupting him, she calls him conceited and storms back into the house, wreaking havoc by the sounds of the crashing and the cursing as she apparently keeps bumping into things in the dark. “Well, I’m not going to, so you can just forget about it.” He walks away, leaving her to wonder what just happened. Throughout the movie, they both play it very close to the vest, neither of them whispering sweet-nothings or shamelessly flirting. Rather, their banter as they argue with each other is what ironically draws them closer. By the end, we see a mutual respect, two worthy opponents. However, Jason gets in the last word as he rescues Prudy from some overage juveniles throwing firecrackers under her horse. He sweeps her up and while cradling her in his arms informs them that from now on if they messed with this girl they would be messing with his girl. And that’s the proposal. The disinterested hero is finally interested, and the plucky heroine gets her man, despite herself.